"Granny McFlitter's knitting needles have been in a blur, whipping up an entry for the local A&P Show's 'Best Vegetable Knitter' competition. But all of a sudden, the A&P Show turns to chaos when a bull breaks out of his pen. Before you could say 'Mighty mad macho moo,' he's tram... read full description below. 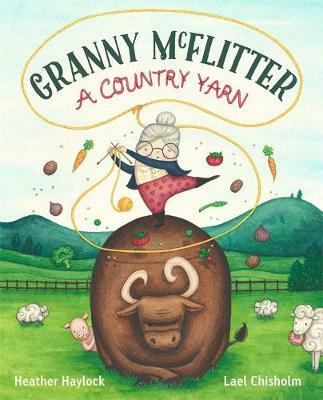 Granny McFlitter, our favourite champion knitter, is back! And this time, it's to save the A&P Show. Can Granny outwit - or should we say outknit - a rampaging bull? Ole! Granny cried, as the cape flapped around.The bull steamed and snorted and pawed at the ground. Granny McFlitter?s knitting needles have been in a blur, whipping up an entry for the local A& P Show?s 'Best Vegetable Knitter? competition.But all of a sudden, the A&P Show turns to chaos when a bull breaks out of his pen. Before you could say Mighty mad macho moo , he's trampling pavlovas and sponge cakes. Everyone dives for cover - but not Granny McFlitter. She has a plan to capture the bull with - you guessed it - her knitting needles!A brand new, fabulously funny, rhyming read-aloud story from acclaimed author Heather Haylock and Gavin Bishop Award-winning illustrator Lael Chisholm. Heather Haylock- As a child, Heather Haylock spent many years at A&P shows, weaving her ponies' tails into pretty plaits and convincing the ponies to be on their best behaviour for the judges. Now she weaves words into pretty tales and tries to convince her characters to be on their best behaviour for their readers. Heather lives in Auckland, New Zealand, where she works in a primary school and weaves a love of reading into the lives of five-year-olds. She is the author of Granny McFlitter the Champion Knitter, which was a finalist in the 2018 New Zealand Book Awards for Children and Young Adults. Lael Chisholm- The youngest ever winner of the Storylines Gavin Bishop Award has loved drawing ever since she was old enough to hold a pencil. After years of scribbling and doodling at school, home and any other place where a pen and paper was handy, she decided to call her scrawls art, and to share them with the world. Nowadays she spends her free time drawing at her home in Feilding, New Zealand.